Diversity among dolls and toys has been a burgeoning focus in recent years, and, with the help of popular campaigns such as #ToyLikeMe, this movement now includes multiple successful efforts to include children with disabilities. Why shouldn’t children with disabilities have the opportunity to play with people who look like them or who were made with them in mind? Not only do such dolls and toys help differently-abled children feel that they are an important and represented portion of the population, but simply having them as an option in the mainstream toy world allows all kids to understand that there are varying aspects of the human experience — and being different is not something to be feared or mocked. After all, one in four people will experience a disability at some point in their life. Even if your child doesn’t have a disability, he or she likely knows a classmate, a teacher, or a family member who does, and getting them thinking about others’ experiences is a great start toward building empathy. One of the doll and toy companies that has made strides in offering options reflecting disability diversity is American Girl. 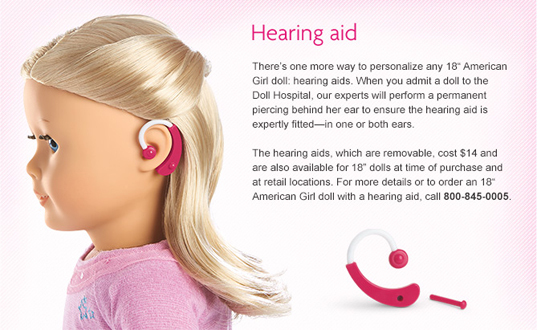 Although the company has declined so far to create an official American Girl doll with a disability, they offer options through their Doll Hospital such as a hearing aid and dolls without hair. The company offers a free doll-head replacement when a doll without hair is purchased, in the event the hair loss isn’t a permanent situation, as in the case of children who are undergoing chemotherapy treatment. We’re also fans of Makies’ “Dolls with Disabilities.” The company uses 3D printing to create customized dolls that include seeing eye dogs, wheelchairs, or birthmarks. 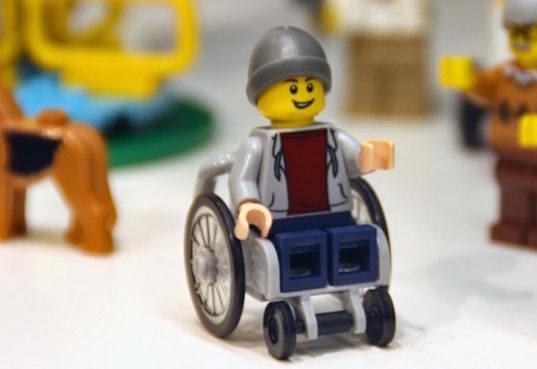 Even LEGO has entered the toys with disabilities forum, offering its first minifigure with a disability, a young man in a wheelchair as part of its “”Fun at the Park” set. The bottom line is that companies, in addition to wanting to create a diverse doll and toy universe, are often driven by their bottom line. So be vocal at your local toy store, with your favorite online retailer, and in communication with the companies directly, and ask for more of these toys and dolls! And use Toys Like Me’s great guide for toys with differing abilities, including Little Mermaid’s Ariel with hearing aids and amazing handmade and bespoke toys such as bears with ostomy bags. Some toy stores have been offering “quiet hours” that make for easier shopping for families affected by autism and other sensory disabilities. It would be nice if the toys available at these stores matched the diverse array of children shopping in them. Diversity among dolls and toys has been a burgeoning focus in recent years, and, with the help of�popular campaigns such as #ToyLikeMe,�this movement now includes multiple successful efforts to include children with disabilities. Why shouldn't children with disabilities have the opportunity to play with people who look like them or who were made with them in mind? Not only do such dolls and toys help differently-abled children feel that they are an important and represented portion of the population, but simply having them as an option in the mainstream toy world allows all kids to understand that there are varying aspects of the human experience -- and being different is not something to be feared or mocked. After all, one in four people will experience a disability at some point in their life. Even if your child doesn't have a disability, he or she likely knows a classmate, a teacher, or a family member who does, and getting them thinking about others' experiences is a great start toward building empathy.